Householders are suffering poor quality workmanship at the hands of rogue traders report industry experts, the National Carpet Cleaners Association. The National Carpet Cleaners Association (NCCA) are the UK trade body dedicated to the cleaning of carpets, soft furnishings and hard flooring and have been setting the standard in this industry for over forty years through basic, specialist and advanced training courses for members and non-members at all levels of expertise. Paul Pearce, President of the NCCA, says “We are concerned about the amount of rogue traders operating within our industry. We often hear from householders who have been misled by the tradesmen they have let into their homes. A prime example is the ‘cleaner’ who claimed to clean carpets using a revolutionary new technique for a mere fifteen pound. It materialised that this ‘high-tech’ cleaning process was actually a sprinkling from a watering can filled with cleaning fluid! These traders are part of what we call the ‘hit and run’ brigade. They are unscrupulous people who take on the guise of a cleaning operative in order to make money, and then may disappear into thin air two weeks later. In our experience, disgruntled householders usually find they have no comeback on these operators, because the flyer advertising their services carries no address and only a mobile telephone number. Complaints are ignored and even local authority trading standards officers, many of whom have built up bulky dossiers on the subject, are unable to assist”. The NCCA warns that members of the public should be very careful when engaging any type of business within their home. Carpet cleaning, like any other service, should be chosen on the basis of who is reputable and whether there is an established name and address locally, so that complaints can be made if problems arise later on. Choosing a cleaning business that belongs to the National Carpet Cleaners Association gives some protection for the buyer of these services. NCCA members work to a stringent Code of Practice that protects the customer. The Association has also developed a Publicly Available Specification (PAS) in collaboration with BSI (British Standards Institute) and with input from industry experts from all relevant sectors of the cleaning industry. 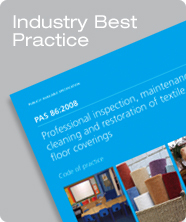 PAS86 is the only government recognised code of practice for professional carpet cleaning.